In the new crime thriller "Destroyer," director Karyn Kusama has an intuitive feel for Los Angeles, its sun-blasted concrete, its overpasses providing shade for skateboarders—seen only in silhouette—the sidewalk churches covered in murals, the little unfashionable neighborhoods in stark contrast with the rolling greens of the mighty and corrupted rich. It's Los Angeles as diverse wasteland. 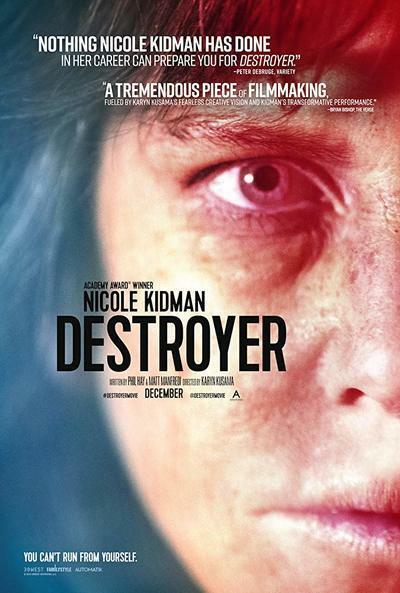 "Destroyer" is about a detective (Nicole Kidman) who, 20 years before, had such a traumatic experience during an undercover operation that she never bounced back. "Destroyer" shares many similarities with the spate of films in the 1970s about the corruption of law enforcement, and frustrated cops who resort to vigilante justice since good old law and order doesn't move fast enough. Erin, the cop in question, is a wreck of a human, her life destroyed, her career and reputation on the rocks. Climbing uphill, she sets out to make the past right. This is a pretty rote story, and many of the plot points beggar belief, but Kusama's flourishes help somewhat to elevate the material into something more meditative, a character study of a woman in ruins. Flowing back and forth in time, "Destroyer" shows the past in flashes, the unfolding of the undercover gig, and the choice Erin made which still haunts her. Erin does not manage her guilt. She drowns it in alcohol. She has no relationship with her teenage daughter Shelby (Jade Pettyjohn), and any "motherly" concern she shows about Shelby dating a much older man is greeted with a mixture of scorn and rage. Early on, Erin shows up at a crime scene, such a hungover wreck her colleagues tell her to go home and sleep it off. But Erin knows that this dead body is a message to her from the past, from Silas (Toby Kebbell), the scary criminal heading up the gang she had infiltrated many years before. Nobody believes her when she describes the threat. She has burned every bridge. She sets out on her own to unweave the tangled web of money laundering, drug dealing, and bank robbing. In the process, she confronts her past. It's not a pretty sight. Neither is Kidman, whose haggard appearance in "Destroyer"—compared often to Charlize Theron's transformation in "Monster"—got press long before the movie even opened. Look how "bad" Nicole Kidman looks in her next movie! Kidman's choice to go as radical as she does with her appearance makes "Destroyer"—a pretty slight film, really—weirdly top-heavy. It's all about how "bad" she looks. Kidman is one of the most gifted actresses working today. She takes risks, big risks. I treasure that about her. Even her "failures" are more interesting than most actresses' successes. She does a lot of interesting things with Erin, in particular with her voice, which rarely rises above a near-whisper. You have to lean in to even hear her. Kidman's intuition about the voice is spot on. This is a character with no excess energy, no resilience, nothing to call upon. But the problem is she doesn't just "look bad" in "Destroyer." She looks like a zombie staggering out of a mausoleum. It's distracting. Sandra Bullock played a similar type of character in "Murder By Numbers" (one of Bullock's best performances), and she managed to suggest the wreckage of the character's life, her inability to experience emotions, her buried trauma and self-destructive coping mechanisms, through her performance, not a makeup job. Erin's solo attempt to solve the crime has a propulsive drive, especially since everyone—colleagues, her daughter, her ex (Scoot McNairy)—has had it up to here with her surly behavior and nightly benders. She has no comfort zone, no safe space. Erin's solitary struggles in "Destroyer" have a different feel than, say, "Serpico" or "The French Connection," where the renegade cops breeze through the waves of suspicion almost untouched by all of it, certain in their righteous cause, almost charming in their amorality. But Erin is not seen as charming at all. How much of that is because she's a woman, written off as "too emotional" anyway? When she lumbers across the richly-manicured yard of a filthy defense attorney (Bradley Whitford), to confront him about his role in the crime, she looks both ferocious and vulnerable. She has no backup, literally and figuratively. There are a couple of good sequences, in particular a bank robbery where Kusama shows a real gift for pacing and action, for careful placement of multiple characters (you always know where everyone is, even during the chaotic shootout). The sequence has a real electric charge, down to Kidman's authoritative flashing of her badge at the two cops showing up at the scene. The dreamlike sequences, where the action slows almost to a standstill, are beautiful and sad, drawing you in to her loneliness and despair (more than a dramatic makeup job can do). The final shots are stunning, although slightly overwrought. Like Kidman's transformation, it's a little "too much" for what is a fairly standard crime thriller.